The young, upbeat voice from Sunrise Hospital told me that I had to go back. For another mammogram. For an ultrasound. For a closer inspection of the suspicious mass in my breast. It turned out to be a banal cyst, a slender pouch full of innocuous liquid, my own spectral water balloon or privately honed kelp bladder, a teeny Ziploc of clarity. In the 48-hours between the call to judgment and the announcement of salvation, I considered what might happen if the end were thrust upon me. I ventured out to the rim of the cliff and gazed into the abyss, took a clumsy step forward, a quick step back. I peered cautiously over the edge and took in the view—life stretched large and wide and deep. There are my Beloveds! And there are the grubby backyards of youth! The fossilized sea urchins from the wadi in the Sahara, the polka dot rock from the gully in the Mojave. I saw my son’s infant face, as radiant as the May moon, and my lover’s eyes, as rich and precious as gems. My friends came easily to mind, as if buoyed from the depths of experience, where each has made a mark, an impress, an indelible contribution to the woman I am today. The Big Questions, the ones that have remained unanswered for eons, seemed more urgent the more I contemplated the slippery brink of non-existence. I had a sudden urge for mandalas—yes mandalas. These colorful maps, made by Buddhist and Hindu monks, show you the way to the other world. If the news is bad, I thought, I will hang them all over the walls of the house. I will paint them on the walls. I will also rescue a kitten from Petland and ensure its well-being. I will read Proust in French, which I’d been saving for old age. In the meantime, I decided to eat an ice cream, a rare treat on my heavily patrolled food, exercise and supplement regime. But mostly I looked into the pit and just felt scared. The Breast Center at Sunrise does what it can to allay the fears of the scores of women who pace anxiously down its cheerful halls. Signs say, “Relax!” And “We care!” The bright murals and floral posters add a comfy note of good will. But even the smiling receptionist, as large and ample as the Venus of Willendorf, could not allay my impending sense of doom with the billowing folds of her maternal flesh. In the second waiting room, the one where patients perch in floral hospital gowns on the edge of plush chairs, I saw a woman who looked as nervous as I felt—something in her face was a little too taut, a little too pale, as if her skin was trying hard to protect her. She, too, was on a call back for more tests, a closer look. “Most of the time it’s nothing,” she said with a weak grin. We’d both been trawling the Internet for the percentages, playing the odds. We knew the score. We’d both chosen The Breast Center at Sunrise because they give you the news on the spot—no waiting for the doctor to return your call days later while you contemplate the abyss, wondering how soon the ground is giving way. I hope her verdict was as joyful as my own. As I dressed, I vowed to make use of the reprieve. To be gentler with those I love. To spend more time beneath the open sky. To finally finish the book that doesn’t want to be finished. To occasionally allow myself an ice cream. As I stepped out of the elevator, a woman about my age was going in. She was wearing a white skullcap, embroidered with white thread and trimmed with white lace. It gave her a sort of wedding-cake style that complemented her pretty, porcelain features. Her hair was gone from the chemo. She smiled at me—a broad, beautiful smile, genuine and full of precious life. 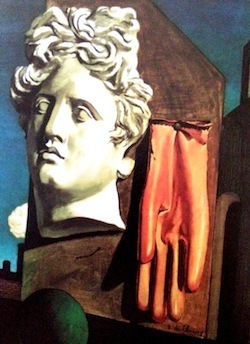 Photo of the 1914 painting, Song of Love, by Giorgio de Chirico. This entry was posted in Healthcare and tagged abyss, body, Buddhism, death, healthcare, Hinduism, hospital, ice cream, life, love, mammogram, mandala, Mojave, Petland, Venus of Willendorf, women. Bookmark the permalink. ← “Mind in Vegas” Is Upping The Ante! I’m glad you’re o.k. Dawn-Michelle. Thanks, Mickey. Me, too. It really made me think. Such a well said story. It resonates with my own similar situations. I am going to go to Las Vegas to the Breast Center at Sunrise since they give you news on the spot. It’s the waiting that’s the hardest part. Internal sleuthing of the finite kind.